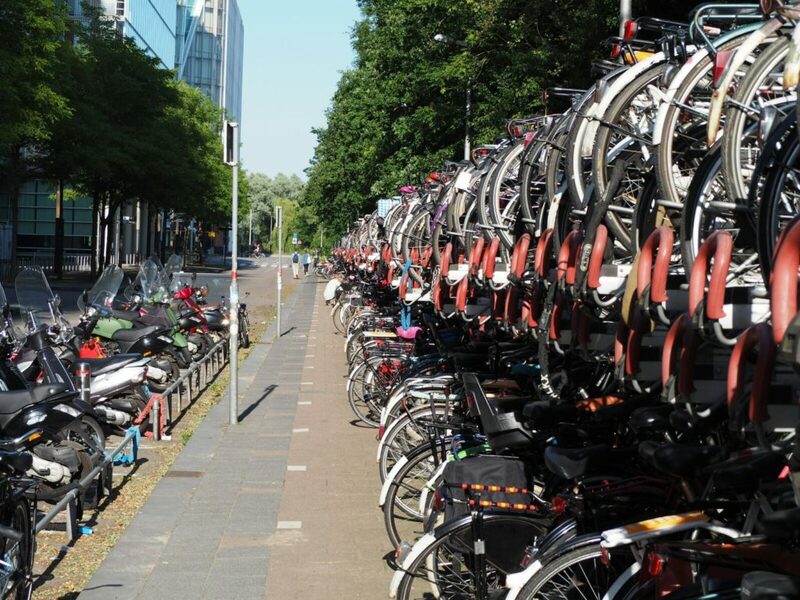 09-11 June 2017: Yep, the Hammer boys went Dutch and descended like a plague of locusts on the fair city of Amsterdam this weekend just gone. 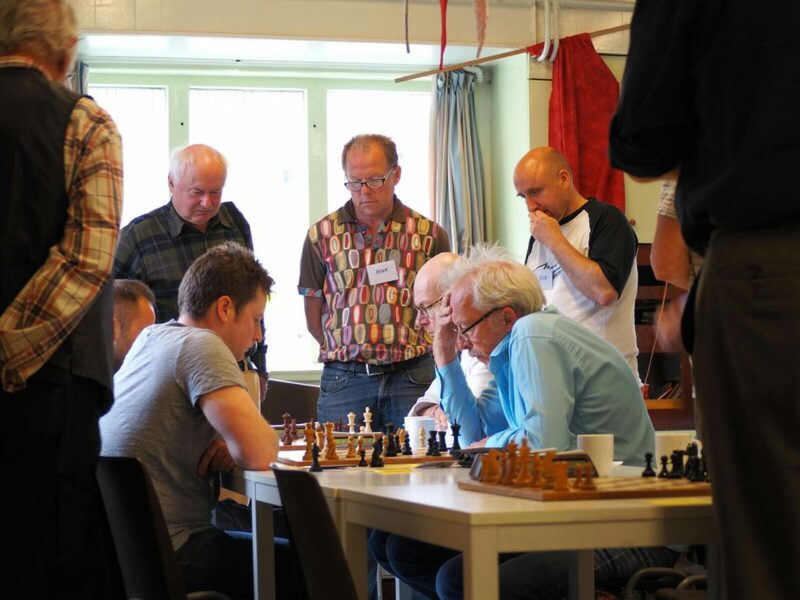 The Hammer crew needed chess satisfaction, and unlike Mick and the Stones, we got a serious overdose of it! Twelve brave souls and a few family members ventured forth. Before we get to the gory details of the weekend, just a few words about how it all came about. 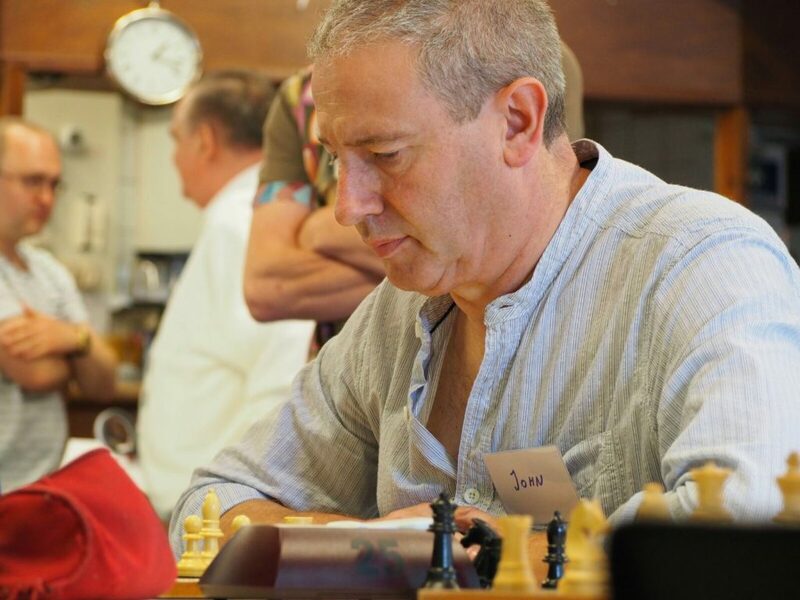 After the Brexit result last year, your correspondent decided in conjunction with the Hammer Committee, to organise a weekend raid on a European Chess Club. The aim to show that, although the UK was exiting the EU, we are most definitely not exiting Europe! Chess would be used to build bridges, and of course provide the perfect cover for consumption of copious amounts of beer. No expense spared for the Hammer crew! 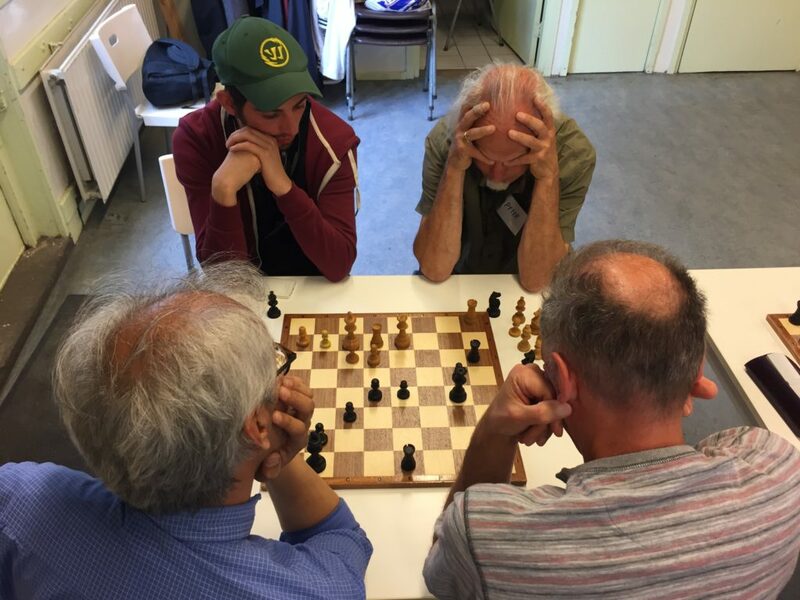 A furious Google search yield Du Pion chess club in Amsterdam (check out their website: www.espion.amsterdam). 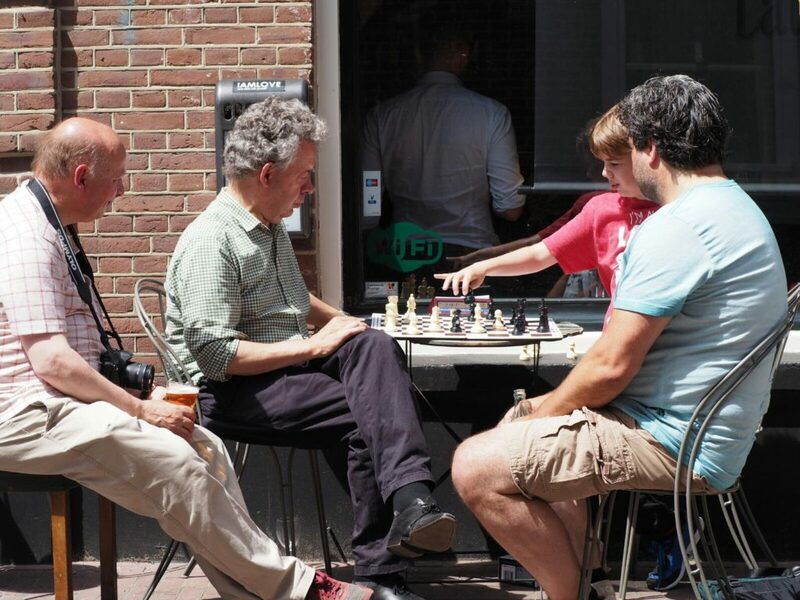 A beautiful city steeped in chess history, beer and culture… a dream destination for any chess aficionado. First contact was made and a swift dialogue was quickly established. They would be delighted to host us – little did they know – and the dates were fixed. A more disreputable and diverse group of Hammerites you would find hard to pick. Clueless and Henk.. a match made in Heaven! 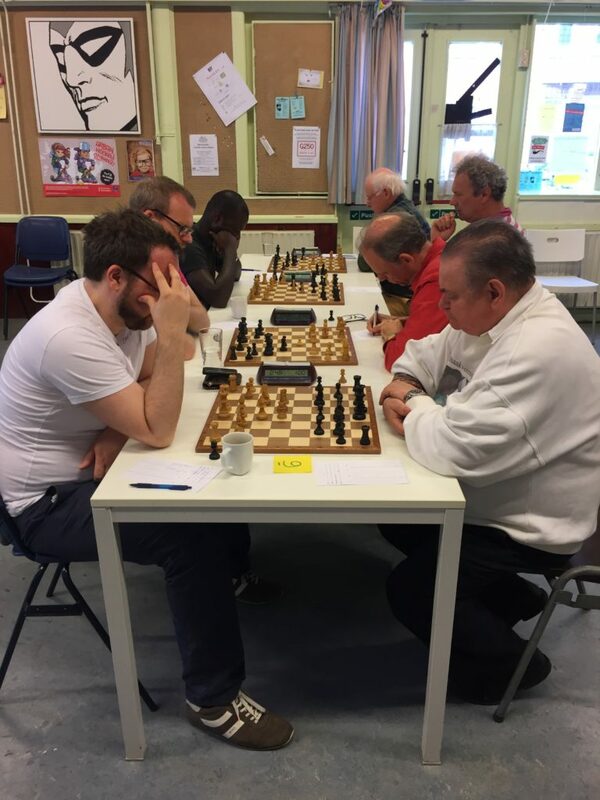 Before I got onto the action I must say a special thank you to Chairman Raymond and all of the Du Pion Chess Club for a superbly organised weekend. They were so hospitable, friendly and generous. The bar has been set very high and Hammer will have to step up to deliver a comparable program when the Dutch club pay us a return visit in June 2018. 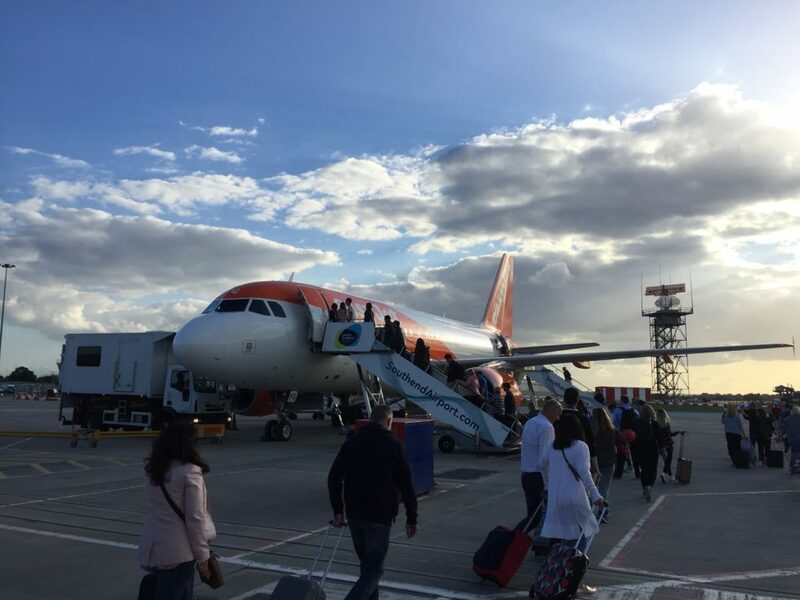 The Hammer contingent arrived by plane at different times on the Friday, and were staying at various locations around the city. 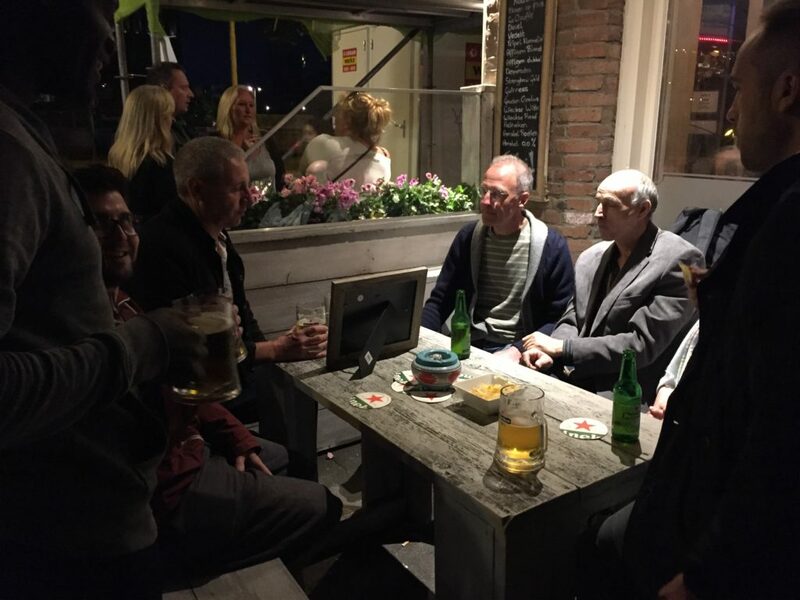 However, a few of us – Wily, Pickly, Dead-Eyed, Spidey, The Suit, Kool, Brexit and Clueless – gathered at Cafe de Kaaiman for an informal drink at about 11.30pm. The bar had an extensive range of draught beer to tempt you – Heineken, Heineken or Heineken. Sometimes choice can be overrated. Cafe de Kaaiman… Hammer plot their raid! 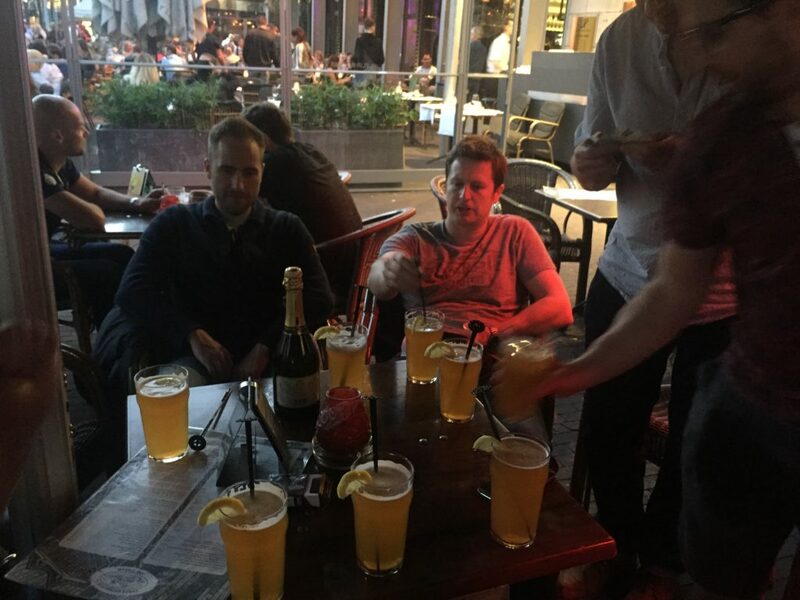 The lack of beer choice, however, did not impede the conversation and the bonding of the Hammer squad. 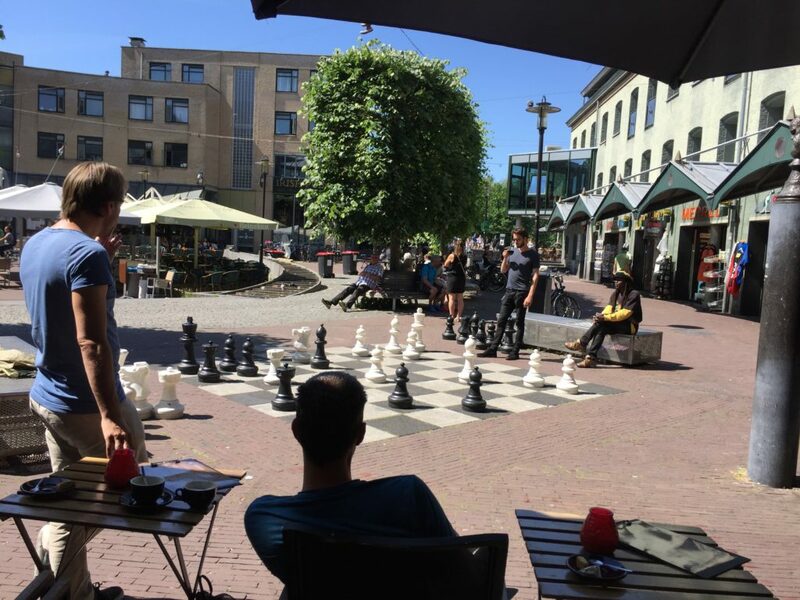 We were here to make new friends, enjoy a fabulous city and play some chess. The squad was primed to deliver. Beer always helps fortify the soul, especially in chess matters. The next morning we gathered at Henrick de Keijserplein 45 at 10.15am – Brexit was late and confused (like the real thing??) – and met our counterparts from Du Pion. 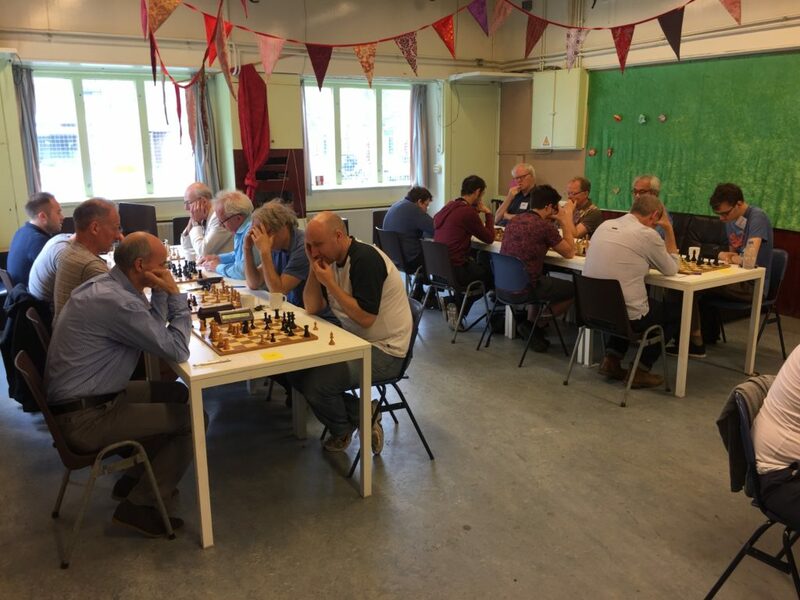 A great venue, it was well-organised and Du Pion are a well-equipped and superbly-run chess club, with nice sets and boards plus loads of digital clocks. Free coffee and snacks were available in abundance and we got chatting to the Du Pion chaps. With ice broken, Chairman Raymond made an excellent welcoming speech in perfect English (why are they so good!! ), and presented two framed photographs of Nigel Short to Wily and your correspondent, Clueless. Breaking bread (and coffee) with the Dutch! Responding on behalf of HCC, Clueless effusively thanked all at Du Pion for their invitation and presented a framed photograph of Julian Hodgson, personally signed, to Raymond and Du Pion club. There then followed the excruciating sight of your correspondent giving an eleven sentence speech in Dutch. My nickname for this trip was Clueless and I am pretty sure I lived up to the title extremely will in giving this speech. I think Du Pion were very generous in their appreciation and enthusiasm of my effort and fortunately no diplomatic incidents occurred. Clueless tries his best Dutch! 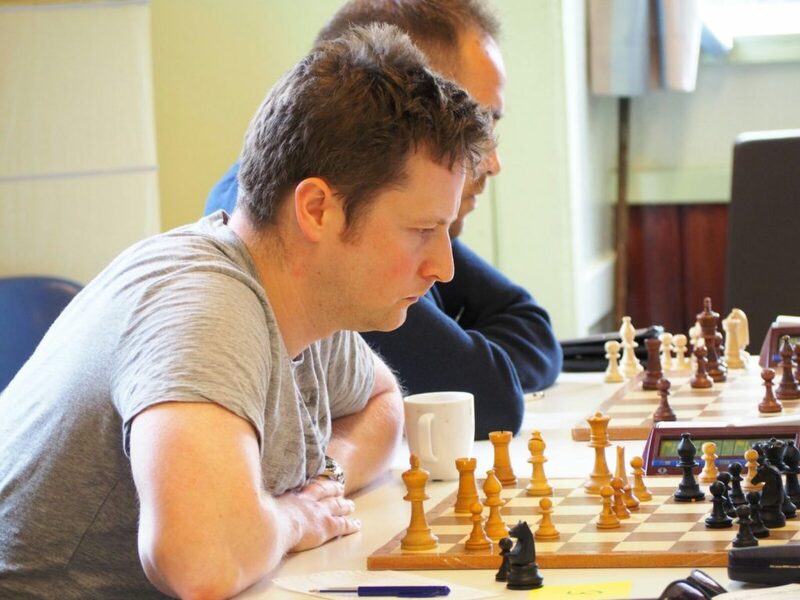 We then got down to chess business – a twelve board match – the really serious part of the day. 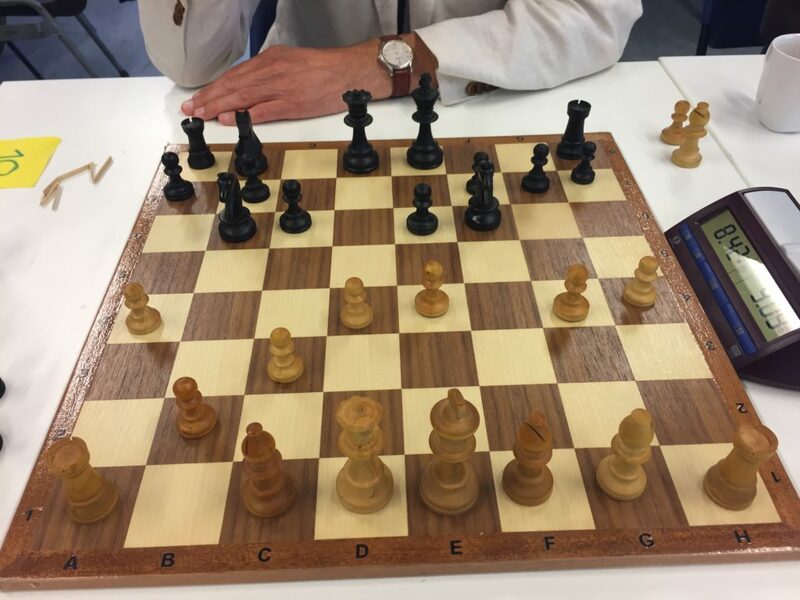 Would the honour of Hammer Chess be preserved, or would we be Double-Dutched? The first game to finish was Spidey, and sadly he lost. Was this an omen? The next result saw Pickle equalise the scores. I think, as my particular game was all-consuming, Hammer went two down when Rave succumbed in a complex game. Hammer were down 2-1 and the flying Dutchmen were on their way. However, Hammer Steel came to the rescue and a series of wins from Wily, Dead-Eyed, Brexit, The Suit, The Wiz, Kool, and R U Serious, put us in a commanding position 8-2 ahead. Cola agreed a draw, and Clueless was the last to finish with another Hammer win. When reporting the result, Henck from Du Pion put it beautifully – our Dutch friends were “modest” in their performance was how he phrased it. 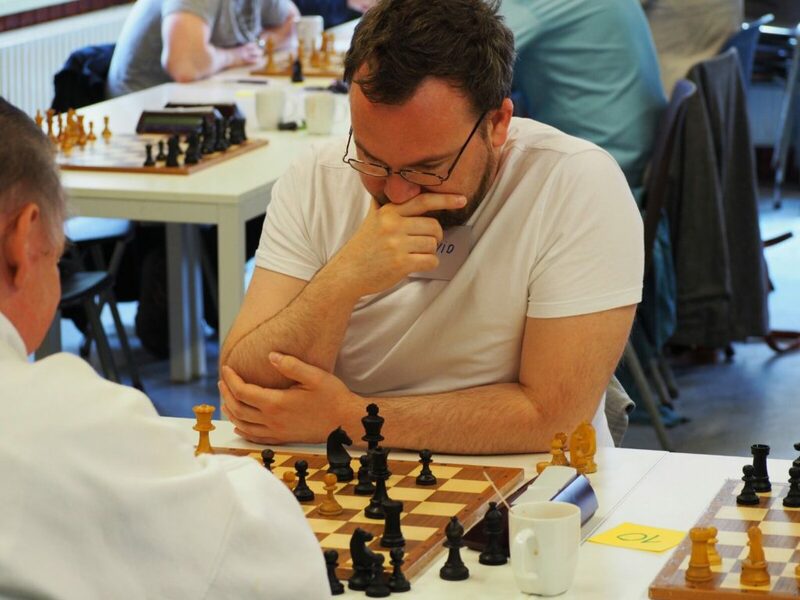 I have to say, Hammer were ruthless and although the idea of the weekend was to make new friends, when it comes to over the board chess, Hammerites are basically cavemen. 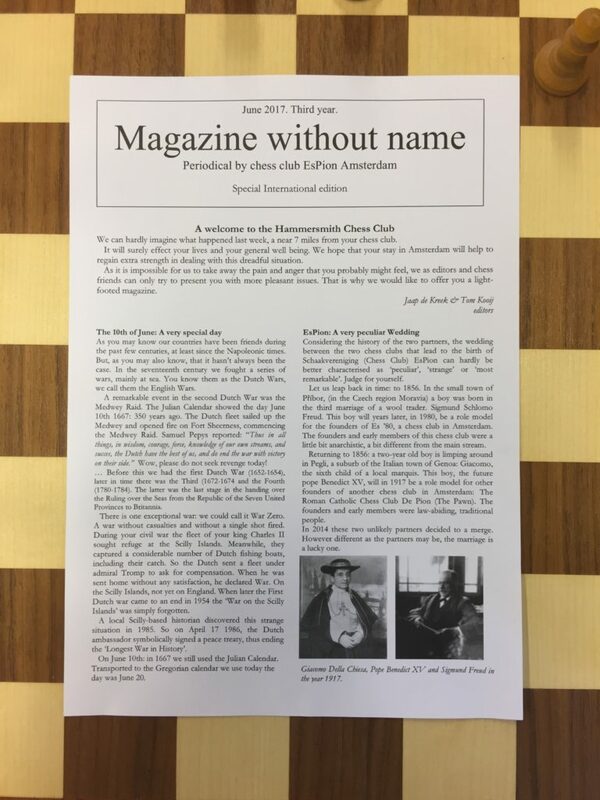 A truly lovely touch by our new friends – thank you! 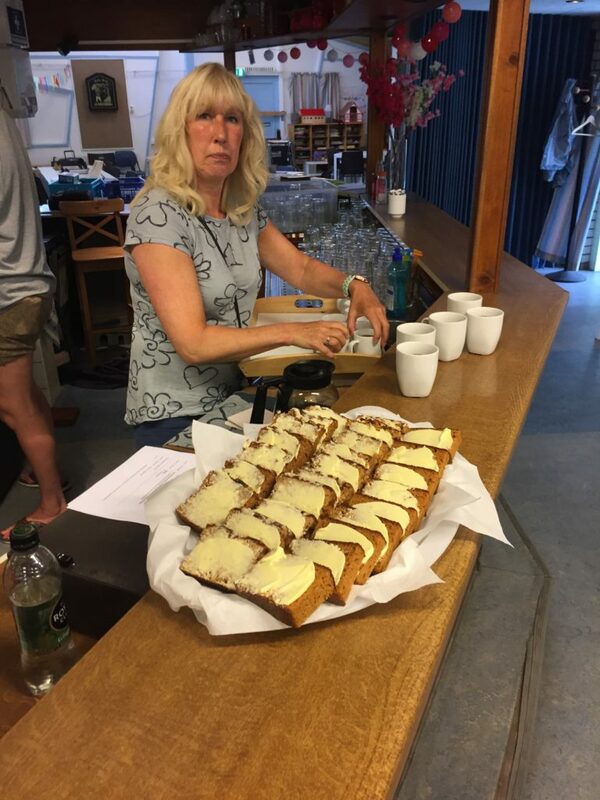 We were then served a delicious lunch with soup and sumptuous rolls, all paid for by Du Pion, and we got to know our friends a little bit more. 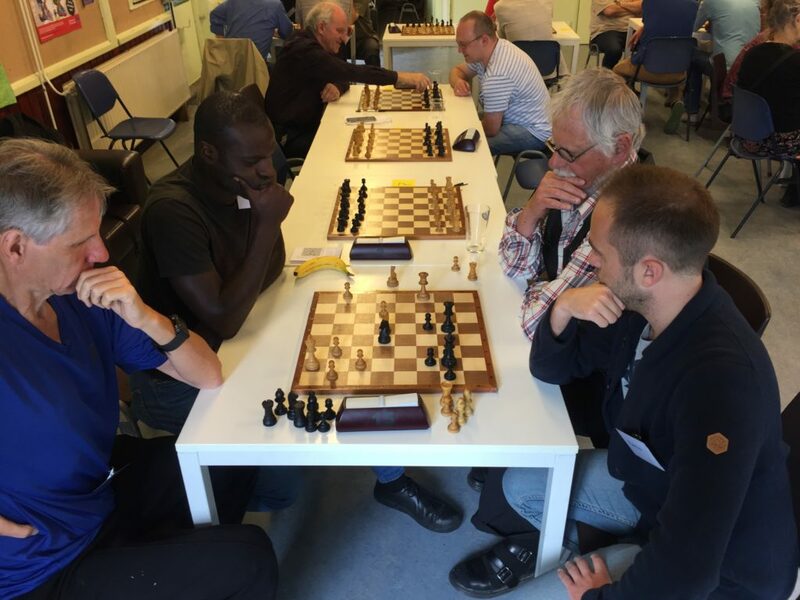 The afternoon session started with some Duo Chess – pairings of one Dutch and One English v one Dutch and one English. You moved alternately and could not confer. This certainly brought the sharp difference in style to the fore. 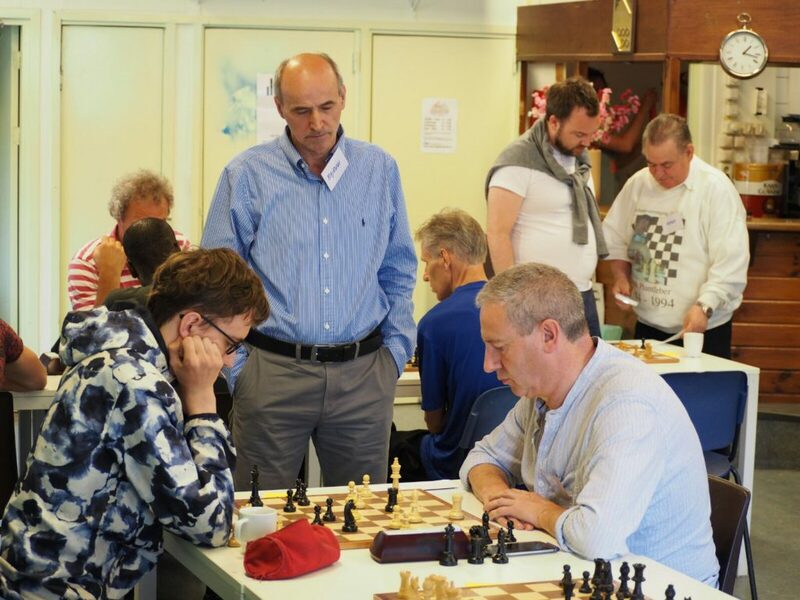 It was great fun and again reinforced the bonding process and common enjoyment of chess. We then broke for biscuits and coffee. I have to say the biscuits were delicious and far too tempting for my sweet tooth. 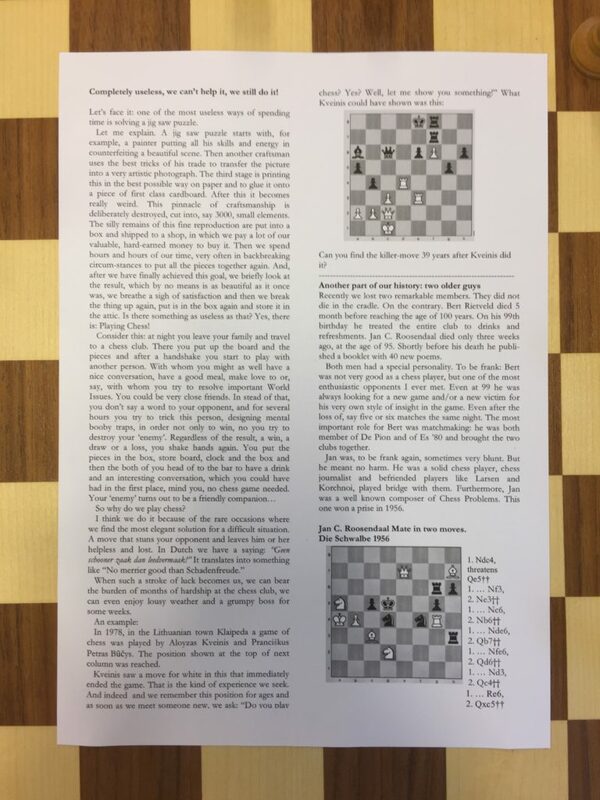 Once refuelling had been finished we returned to two options – some endgame studies, or playing rapid chess where the Hammerites had to play the English and the Du Pion guys had to play the Dutch. 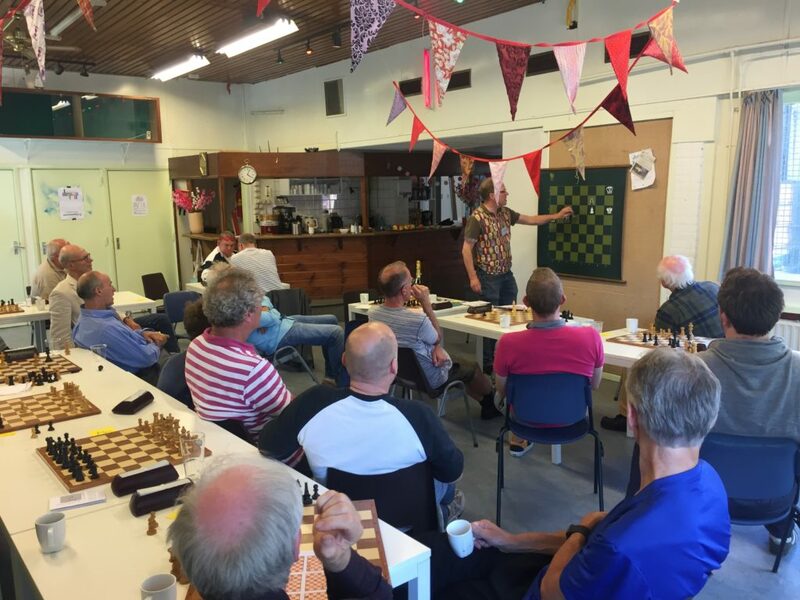 It sounds like a dream session for the Ginger GM (Simon Williams is a serious practitioner of the Dutch) if only he were Dutch!!! The next part of the day was the solution presentation of the Puzzle challenge, with one of the puzzles actually having been the creation of Henck. 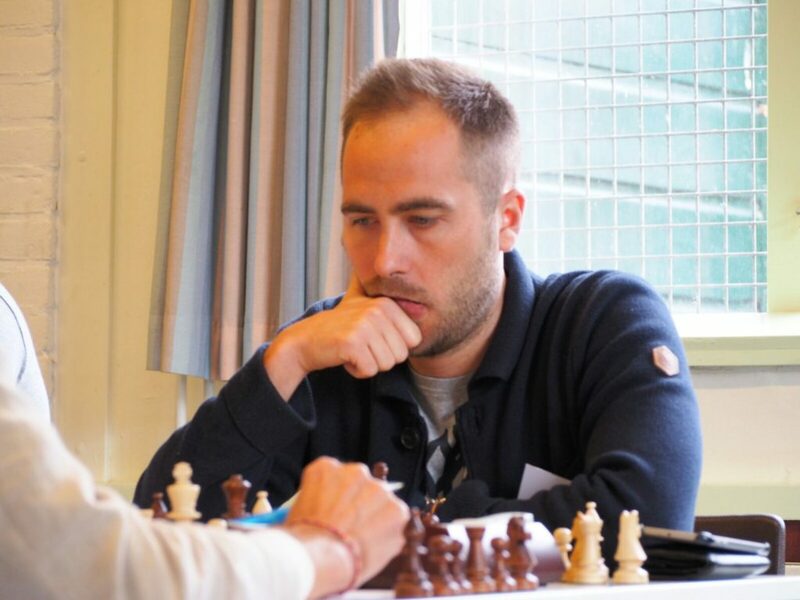 Indeed, it had even stumped the great GM Jan Timman. The puzzles were hugely entertaining and very educational. A real winner. Anyway, this was an unbelievably challenging way to play the game, with the Knights dominating the early stages. 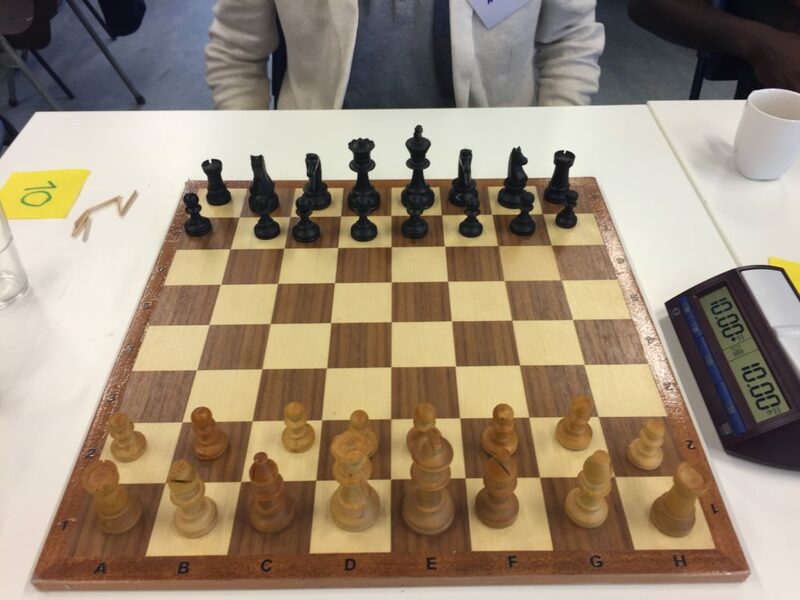 Indeed, the only way for the Bishops to win was to open the position up from move 1 – not an easy task!! This is an idea we may well use during next season at Hammer! 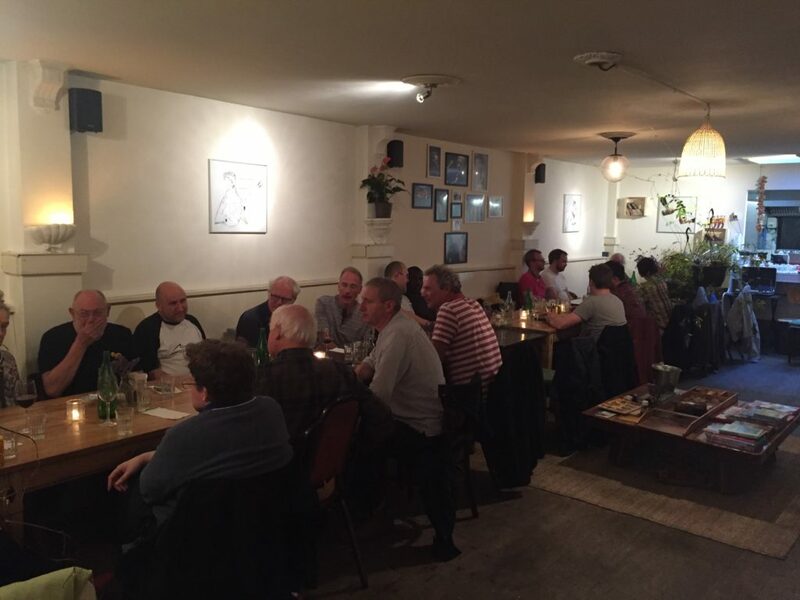 The final part of the day was a meal together at Duble restaurant in the city centre. A Mediterranean establishment with stunning food, good beer and great wine. The perfect location for a great chat and a wind down after the chess mania. Those who chose the main course meat dish had a serious load to demolish, while the healthy amongst us found the salmon dish just right. 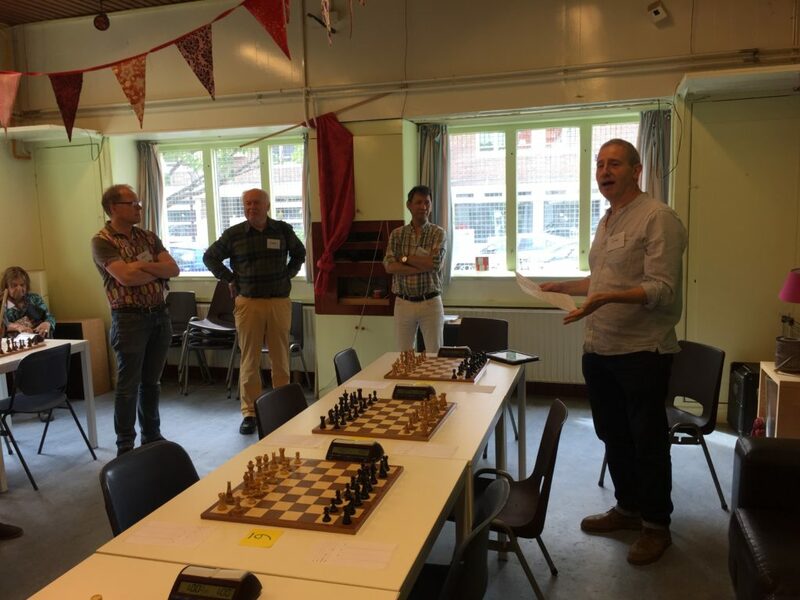 After the chess… the food & drink! The meal concluded and we bid farewell to our new best friends and set forth into the heart of the city to hunt down a bar. At this stage the Wiz, Cola and Wily parted ways for various reasons. This left Rave, Pickle, R U Serious, Dead-Eyed, Kool, Spidey, The Suit and Clueless and we found our Mecca in the form of the Three Sisters in Rembrandt Square. 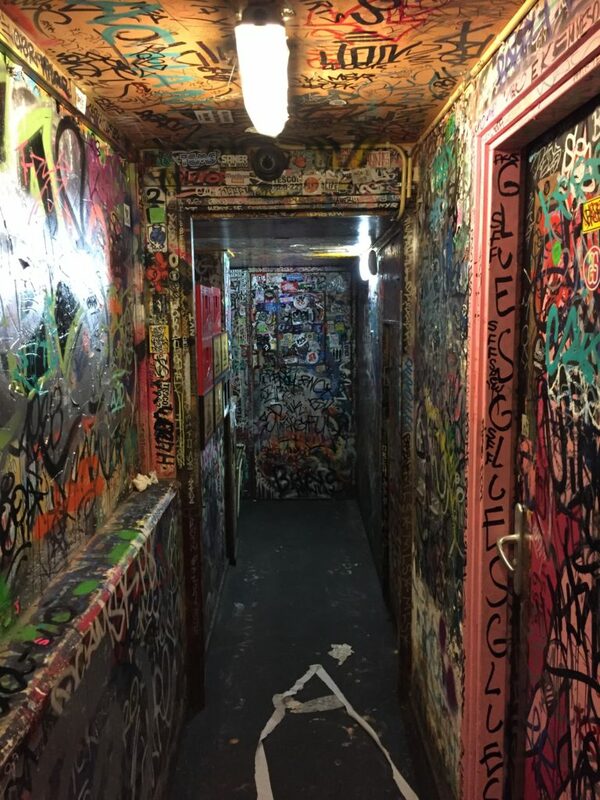 There was nothing remotely artistic about the night except the consumption of beer and the inevitable rubbish that men talk about when beer is free-flowing. I have vague memories of doing a vodka shot, as did some of the others. 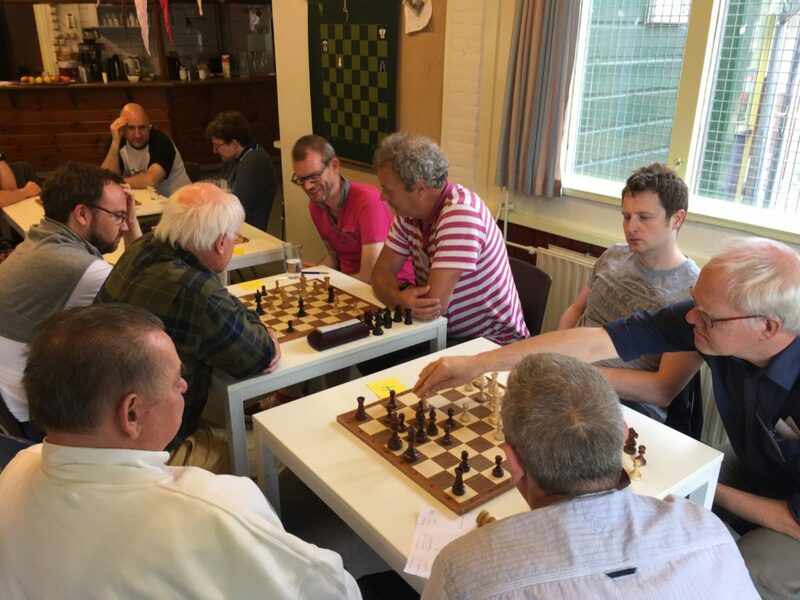 The weary Hammer troops gathered the next morning at the Max Euwe Centre for a privately organised tour – it is great having friends with connections! 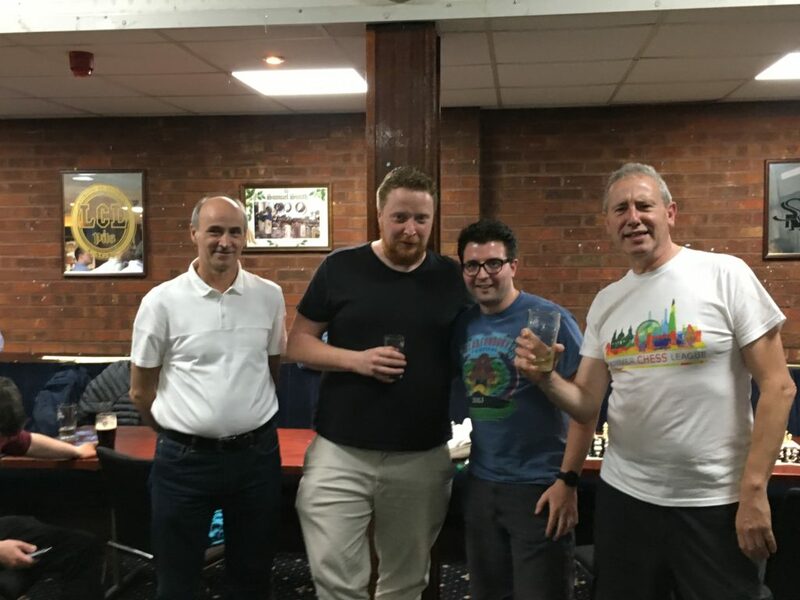 There was many a sore head but the tour of the Centre was fascinating and if the Three Sisters was the Mecca of drinking, then the Max Euwe Centre is the nirvana for all chess lovers. It was like walking through chess history with stacks of memorabilia and a chess library of the Gods. Stories were told by our guide that were insightful and fascinating. It was a total treat. To those of the crew who missed it – not mentioning any names but the Wiz and Spidey – you missed something very special. 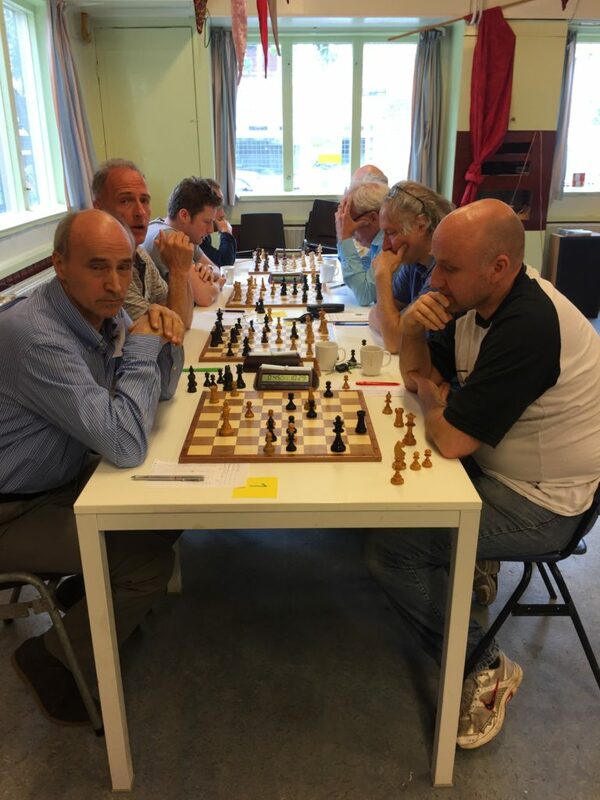 This concluded the organised part of the weekend but Raymond had one more surprise and that was the chance to go to a cafe to watch the two Van Forest brothers (One a GM, the other an IM) take on two FM’s in 3-minute Blitz. They were due to play 50 games each!! I have to say this was too good an opportunity to miss and we enjoyed seeing chess at an entirely different level. The speed and accuracy in the numerous blitz finishes was outstanding and something a mere wood-pusher like me can only dream of. This really concluded the trip and by various trains, planes and automobiles the Hammer crew made its way home to West London and yonder. To summarise – the best of weekends. Great company, new friends, brilliant city, great chess, history, art, beer, food and talking rubbish all reached new rarefied levels. The “Party Till I Drop Animal” – The Wiz – getting home at 8am Sunday morning, just an outstanding effort. 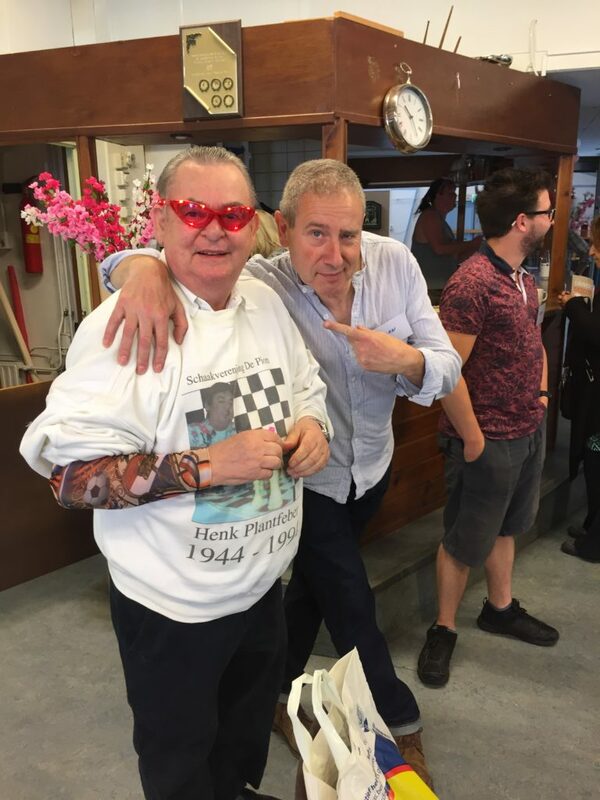 The “Brexit I Know It All Cab Driver’s Award” – The one and only Jeremy, who did provide the photo of Julian – just brilliant company. The “I’m Still Standing After Drinking Most Beer Award” – Pickle – Adam did his club and country proud. The “Cultured and Considerate Hammer Personality Award” – Cola – he saw as much culture as the rest of us drank beer. 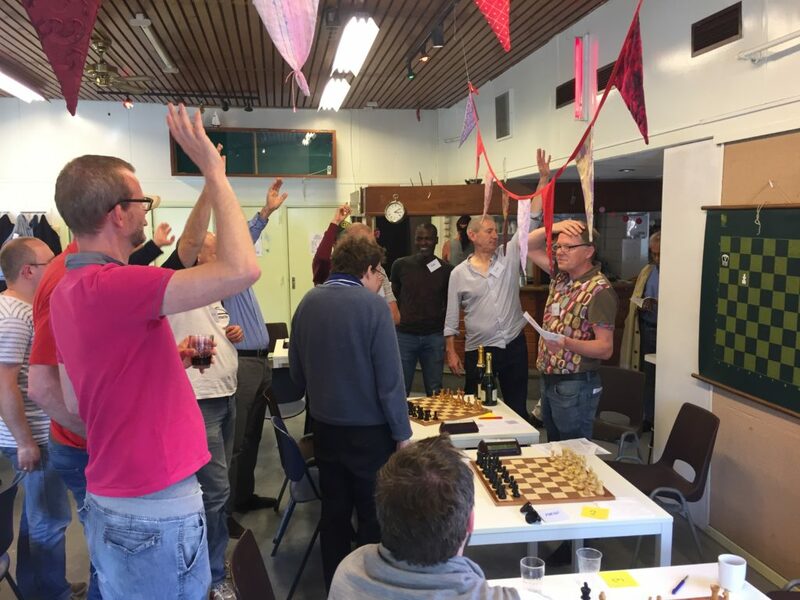 Best Hammer Chess Player Award – we all were!!! My final thoughts are with our new friends in Du Pion – Raymond, Henck, Tom, Dik, Hari and the rest, you were just complete stars! Roll on 2018 when Hammer are the hosts. Clueless now signing off… and in rehab! 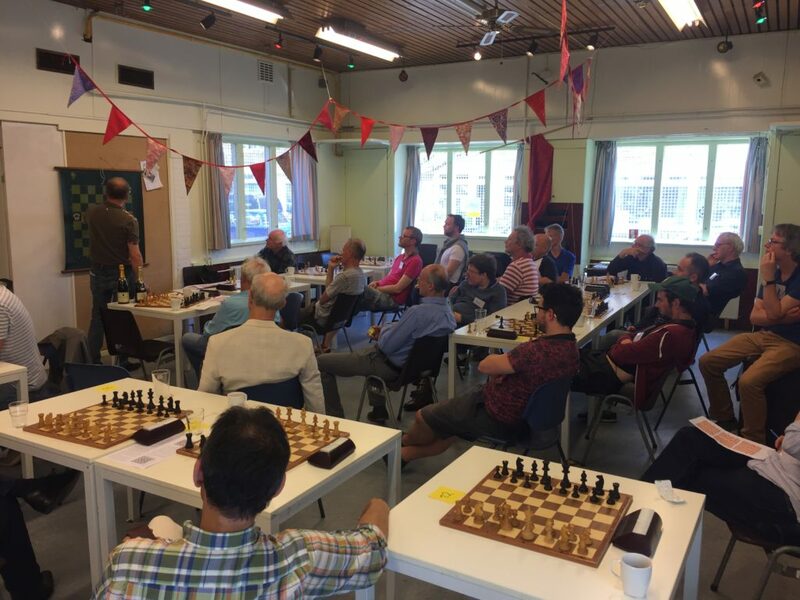 You may be interested in the tournaments below, hosted by Greater London Chess Club (GLCC), which are also open to non-members. All events take place at GLCC’s central London venue at St George’s Bloomsbury, 6 Little Russell Street, London, WC1A 2HR (close to the British Museum). 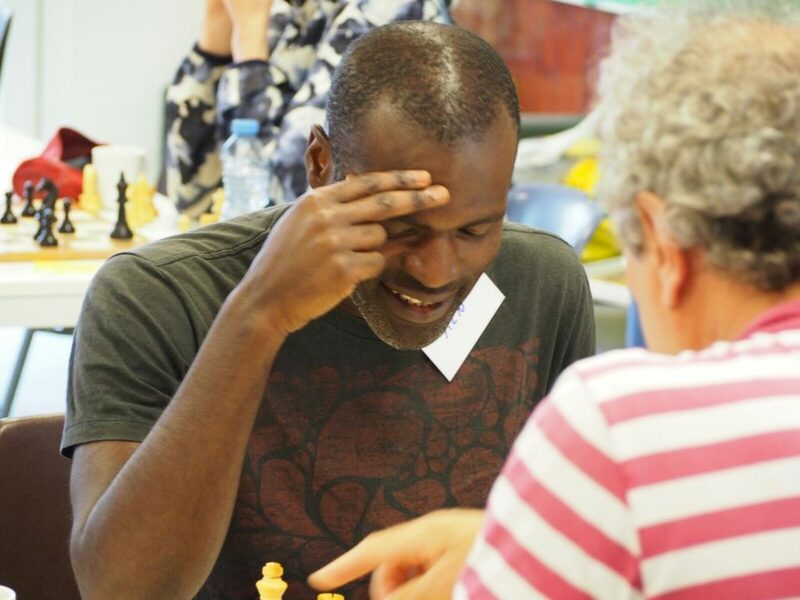 You’ve undoubtedly already been made aware of Hammer’s entry into the inaugural Summer Chess League this year. We’ve got a bunch of games coming up over the next two months and will be in need of players! Check your emails. 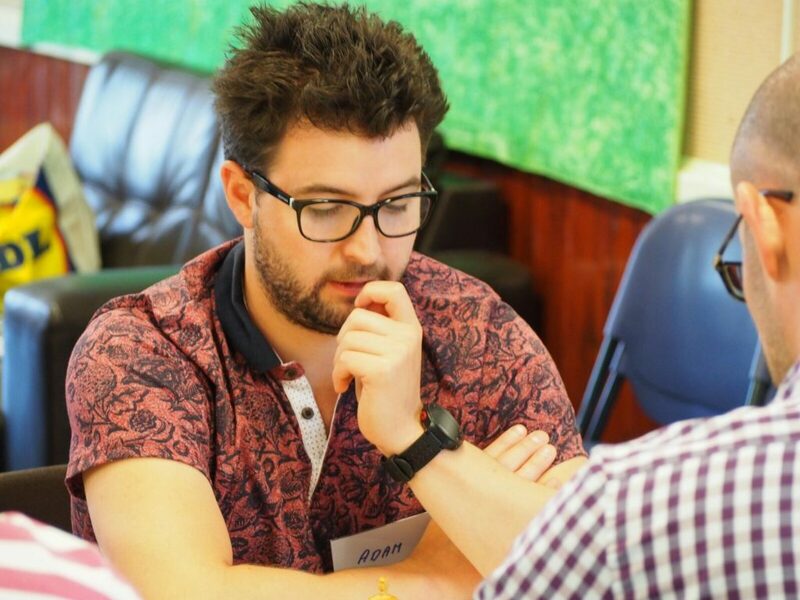 We’re hoping to make this a regular Summer fixture so your support is most appreciated! 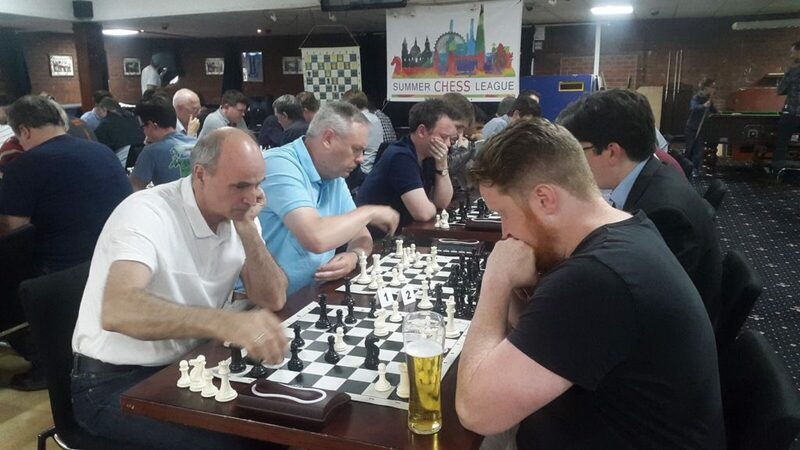 The launch event happened earlier this week at Battersea’s home venue, featuring amongst many others, the Ginger GM, plus IM’s Richard Bates and Simon Ansell.